Connect Exsalerate with Xero to access real time information about your clients. Sales revenue is displayed by account code and we provide direct links to all invoices. Quotes: Choose the Exsalerate pipeline phase title & designated follow up activity when sending quotes from Xero. Invoices: Choose who should be notified by Exsalerate when invoices are raised in Xero. Navigate to Xero Integration via the Settings Page as shown below. 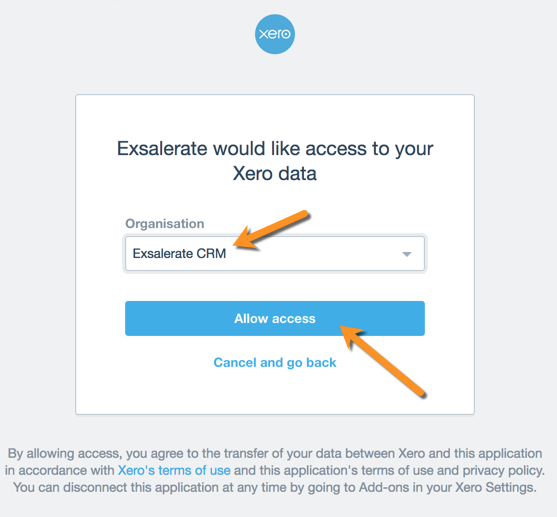 Click Connect to Xero and enter log in details to authorise Exsalerate to connect, then click Allow Access. If you send a quote from XERO to an exisiting customer include your Exsalerate email address within the address bar. The quote will be assigned to the relevant company profile and will also pop into your sales pipeline. Choose the phase you wish this opportunity to sit in within your sales pipeline based on the structure you have designed for your business. Finally, choose the name of the follow up activity you would typically assign to an account manager based on a quote being sent. Include the people you wish to be notified when an invoice is generated - typically this would be a person responsible for approving Xero invoices. These are your Revenue Chart of Accounts codes from Xero, we tap into these in order to visually display your sales data so can view the products & services your clients have been buying. Click import sales codes from Xero. This imports all of the contacts you have issued invoices to in Xero. **Note we don't import contacts that haven't been invoiced, learn how to upload data here. This imports all your XERO suppliers, so you can manage correspondance with them in Exsalerate - ie emails, contact details etc. **Note We don't have the ability to create purchase orders or display billing history with each supplier. This imports all your XERO sales, make sure you enter the date you First Joined Xero so that we can access all your customer sales history.